The last few weeks have been a roller coaster. I'm glad to be back here writing some thoughts about the San Francisco Giants. First, I have to talk about the 2 guys that just left the Giants organization. The reality is that Pablo Sandoval could always choose another team. Then he actually did. It wasn't a shock. It was the news that Tim Flannery would no longer be the 3rd base coach that really surprised me. So many people have their reasons for falling in love with Flannery over the years. For some its the tremendous work he's done in support of Bryan Stow. For others it's the exuberance he brings to the 3rd base coaching position. For me it's a little bit of everything. In August of 2013 I obtained my first press pass for an MLB game down here in Florida when the Giants took on the Tampa Bay Rays. It was "my cup of coffee". I felt so out of place and was freaked out by the whole thing. After Joe Maddon and Bruce Bochy wrapped their pregame interviews guys were just milling around the dugout. I ended up just standing there listening to Shawon Dunston talk. I had no idea what to do with myself. That's when I spotted Flan leaning against the dugout rail. I mustered my courage and introduced myself. I mentioned his music and our conversation took off running. Over the next few minutes we talked about Jackie Greene, Bob Weir, the Lunatic Fringe and others. 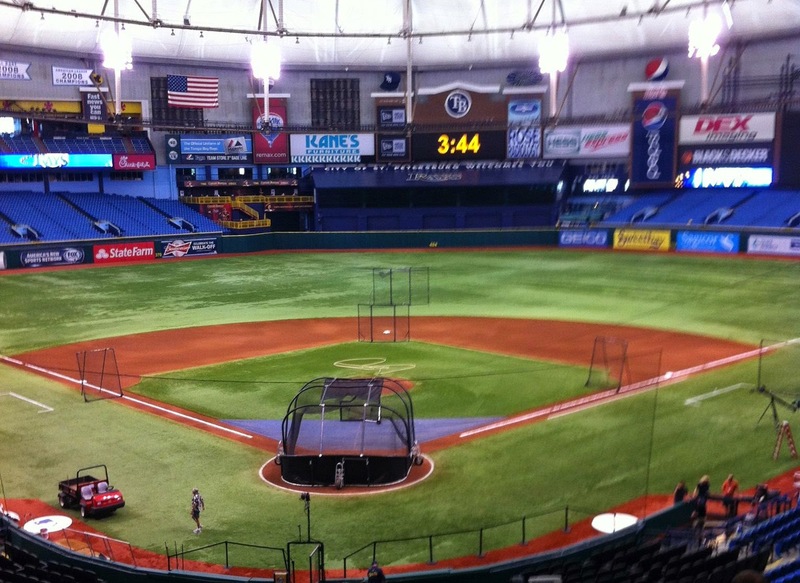 Then the Rays got off the field and he had to go hit fungoes. The conversation totally disarmed me and made the rest of my night easier. Some talk about music is what made me comfortable at a baseball game. Who knew? For the rest of the night I felt like I belonged. That's why I'm gonna miss seeing Tim Flannery down the 3rd base line. Whether he knew it or not he had a big hand in my confidence that day. Of course I'll also miss the arm swinging and knees pumping as he sent a runner home. I'm glad he decided to go one more round with Bochy. Those 3 titles were a lot of fun. Now the rest of what's been going on in Giants land. Am I heartbroken about Pablo Sandoval? Not really. I feel a bit betrayed but that's the little kid inside me. I'm glad he grew up in a Giants uniform and wish him nothing but the best. Wouldn't Jon Lester look good in a Giants uniform? I think so too. I don't know what the Giants offered him but I hope he takes it over going to LA. The Kershaw-Lester-Greinke combo is daunting for any team to face. Today Henry Schulman found out the Giants are talking to Chase Headley to fill the 3rd base position. We also learned that means left field is not a focus this offseason. That's probably why Travis Ishikawa was inked to a one-year $1.1 million contract. That probably means goodbye to Michael Morse. He's suited for a DH role and many AL teams would be willing to give multiple years. He was a good Giant and a big part of the team in 2014. Love that guy's energy. Come on back Melky Cabrera. If it wasn't for second chances most of us would be somewhere else in life. If the guys in the clubhouse are good with it, that's good enough for me. If you've been keeping up with my non baseball life I've got good news. We're moving next week to a safer area of town. The expenses are still building so any help or sharing of our GoFundMe campaign is appreciated. Thank you very much. Here's the link: Our Modern Family. Plenty more baseball to come during the winter, thanks for sticking around!